Last round, I spent more time talking about everything except Google Music (beta)--besides that I had an invitation--and that I love my Nexus S.
There is a valid reason for this lack of talking about the object in review, which is that I didn't really have much to write earlier. Now there's a little more I can share. You see, there are three components to Google Music. There is the webpage, available in any browser with Flash where you can stream music. There is the Android App, from which you can also stream music (or download the track to your device), and there is the Google Music Uploader, a separate program you can download to upload/synch your music collection--from your Windows or Mac computer. When I signed in, Google asked if I wanted free music, to which I said, "Yes, please" and after a moment's consideration I checked all genres--momentarily reminded of BMG Music Service and your local alternative street pharmacist simultaneously. "Just a taste, man. You like it you buy it? Look, you get 12 for the price of just one!" The fly in the ointment is that I don't use Windows or Mac OS. Since about 2006 I've been on Linux of the Ubuntu variety. Really, its a gnat in the ointment, given the mindshare of Linux vs. Windows vs. Mac. I know I'm in the minority, but despite the inability to install Google Music, my computer works wonderfully and politely does what I tell it to, when I tell it to, thank you very much. So although I had the invitation for basically the whole month, it was only a week or two ago that I was actually able to do more than kick the tires and adjust the mirrors. Now I've been able to give it some gas and take it on the highway. I'll be covering the initial process in this post--the uploading process. Now, despite my living on the fringes issue that held me back, I did make an attempt to try everything out earlier. I had a brief go on a desktop at home, which is the only dual booting computer I allow online. However, due to our internet connection/wifi/gremlins, the upload was only partially successful, and mostly fail. I didn't even chart or notate anything from that experiment, and decided to try another way. With the gracious permission of one of my (numerous) employers, I installed the Google Music uploader onto one of our office computers. I didn't screenshot this process, but its basically like any installation wizard. Its prettier than the average, but nothing to write home to mom about, or screenshot for a blog. Once installed, it ran through a couple questions to streamline the settings process, asking where I keep my library. I went for the Advanced Options, during setup, and then I double checked them afterwards. Basically Google Music is set up to take over from what you're already doing with your music library. 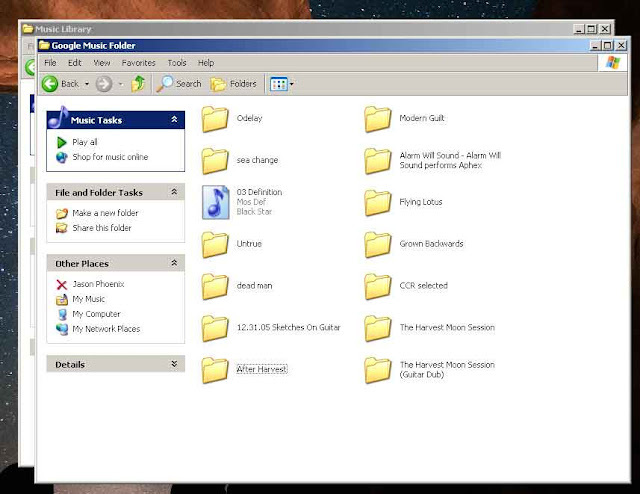 If you're using the Windows Media Player to organize and play your music, Google Music can siphon from that. If you're on iTunes, same thing. But if you're like me, you might not want to synch 250 Gb of sometimes random and unsorted music. 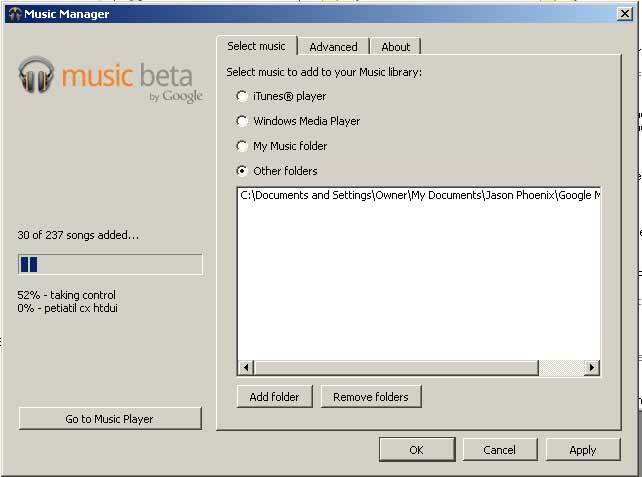 Google Music (beta) Select Music Folder Options. Also some RJD is uploading. Because I intended to specifically test how synch works, I went through the advanced settings and told Google Music what folder I wanted to have synched specifically, rather than having everything the office computer ends up with in its iTunes library end up on my account. I also wanted to check and verify that I can delete files from my Synch folder, and that they'll stay on my Google Music account without it checking back to see they're still in my synch folder and deleting them from my Google Music account. And finally, I was under strict orders not to have my uploading affect the office network/connection, and there are options for that as well under the Advanced tab. This area could be very useful for someone who always wants their Library synched when they drop a new album, or wants to avoid tying up their whole Internet connection every time they get several albums. Bandwidth options are similar to Picasa's uploader, and scale nicely from dial-up to faster. 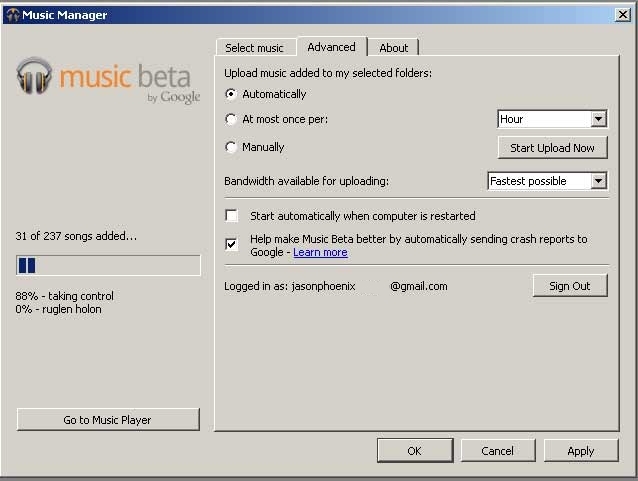 Also you can have the Music Uploader automatically start when your computer reboots...or just launch it yourself when you choose. That whole process took me maybe 15 minutes, less time than it took me to decide what I wanted to stick in the folder...which took decidedly longer. I dropped and dragged and copied and pasted, trying to hit one of every variable. So there was an individual track, several albums (including an obscure soundtrack), one compilation I made of Creedence Clearwater Revival, and then some of my own music. 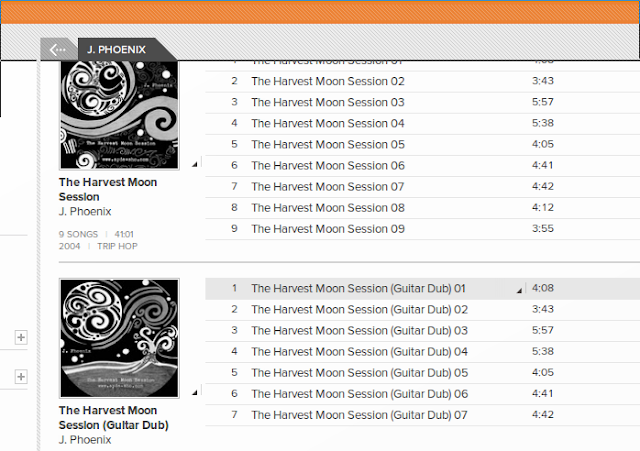 First Upload Batch on Google Music. So basically that simple. I dropped and dragged the files into the synch folder, told the Google Music Uploader which folder to synch, and the files began processing. The process is watchable from the Google Music Uploader, but I believe a watched uploader always hangs. We locked up shop, I went to my other other job, and my semi-random files uploaded in my absence overnight. When I woke up the next afternoon, I checked my Android phone for the artists I knew I had uploaded with my Google Music App. They were all there. Everyone of them had uploaded successfully, and all of them had self organized. When I got to the office, I checked the Google Music Uploader, which has a diagnostic function, and it said complete success on the uploads. As you can see above, the three Beck albums I uploaded are available, searchable, and organized. They're playable from the browser or my Android in pretty much the same way. And they sound great as ever. My own music got the same treatment as Beck, which makes me feel like I'm rubbing shoulders with giants as I sort through my library. Vanity aside, this bodes well for anyone like me that isn't on Gracenote or another means to track my works (yet). I'm semi-famous! Or at least I'm instantly accessible. So that's the uploading process in a nutshell. It worked well with the album folders, individual MP3's, and pretty much self-organized from the metadata, even extremely obscure music like my own. After my tests and notations, I dropped a lot more music into the uploader, and then I've spent a couple busy weeks getting used to the interfaces and trying to find bugs. So far, I have to confess that Google Music is one of the coolest things I've ever played with, hands down. This is something I didn't realize I always wanted, but now that I've got it, I never want it to go away. 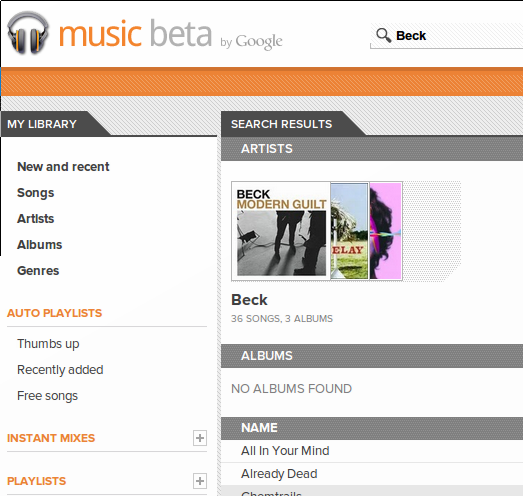 For my next post, I'd like to go over the interfaces for Google Music, both in the browser and and on Android. This should require video, will include video to give you an idea of how well the actual human interaction side works out. Which means this is apparently becoming a vlog*. *Uh oh. Well... I did say multimedia artist, didn't I?